Some antiviral drugs, like acyclovir for treatment of herpes simplex virus infections, are chain terminators that block RNA or DNA synthesis. They are modified nucleotides that can be incorporated into a growing RNA strand, but no additional nucleotides can be added. Amazingly, a cell protein has been found that can synthesize antiviral chain terminators. Viperin* is a cell protein that inhibits infection with a wide variety of RNA and DNA viruses. How the protein functions as an antiviral remains obscure, despite its discovery in 2001. But the mystery has just been solved: viperin is an enzyme that catalyzes the synthesis of an antiviral ribonucleotide. The synthesis of viperin mRNA is turned on by interferon (IFN), a cytokine that is induced by virus infection. In vertebrate genomes, the gene encoding viperin is always found next to the gene encoding cytidylate monophosphate kinase 2 (CMPK2). In cells treated with IFN, both viperin and CMPK2 genes are transcribed. Because CMPK2 modifies a nucleotide, these findings suggested that viperin might have a similar activity. To answer this question, the viperin protein was incubated with a variety of nucleotides and deoxynucleotides. 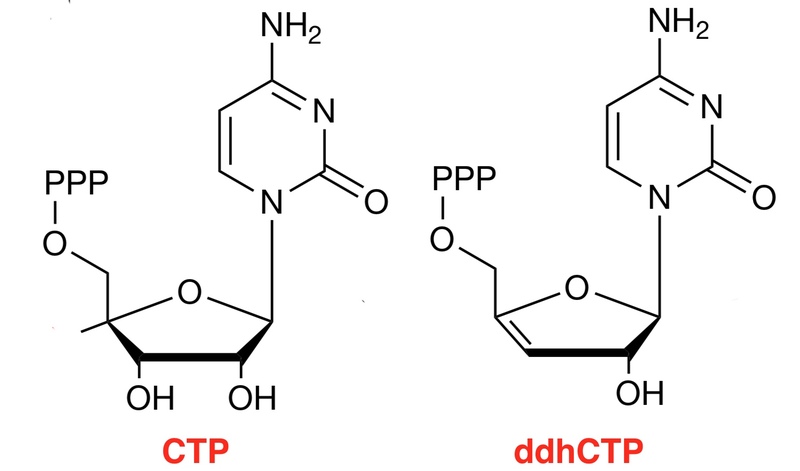 The protein was found to catalyze the conversion of CTP to 3’-deoxy-3’,4’-didehydro-CTP (ddhCTP) (pictured). This ribonucleoside triphosphate had never before been found. 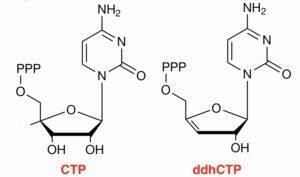 As might be expected for a nucleotide that lacks a 3’-hydroxyl, ddhCTP acts as a chain terminator. The compound inhibits the RNA polymerases of several RNA viruses, including dengue virus, West Nile virus, Zika virus, and hepatitis C virus. However viperin only slightly inhibited the RNA polymerases of rhinoviruses or polioviruses, showing that not all viral RNA polymerases are sensitive to ddhCTP. When added to cells, the synthetic nucleoside ddhC crossed the plasma membrane and was converted to ddhCTP, and substantially inhibited the production of infectious Zika virus. What function does co-transcription of the viperin and CMPK2 genes serve? CMPK2 appears to produce CTP from CDP, ensuring that viperin has sufficient substrate for the production of ddhCTP. Viperin is the only known human protein that can produce a small molecule inhibitor of viral replication. Furthermore, ddhCTP does not adversely affect cells in culture, indicating that it does not inhibit host RNA and DNA polymerases. It is possible that ddhC, or a derivative, might have potential as an antiviral against multiple RNA viruses. Thank you. These matters really are fascinating! are there more details about this study? has it been performed on human beings?